Pick-up from Nairobi Jomo Kenyatta airport and drive towards the Maasai Mara Game Reserve (white route on the map). On the way to the lodge, visit a Maasai village and enjoy the jump dance. Lunch at Mara Sopa Lodge. Game-drive in the afternoon: there are chances to meet some of the big five. Dinner & Overnight Mara Sopa Lodge. 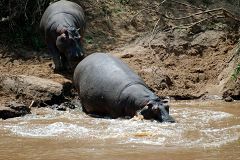 Game-drives according to clients wishes and agreement with driver: the historical Keekorok Lodge, the Kenya-Tanzania border, and the Mara river where hippos and crocodiles are likely to be seen. Lunch at the lodge or picnic lunch. Dinner & Overnight Mara Sopa Lodge. Early moring game-drive followed by breakfast at the lodge. After breakfast, drive towards Lake Nakuru (red route on the map). Lunch at Flamingo Hill tented Camp. Game-drive in the afternoon: flamingos and pelicans are likely to be seen. Dinner & Overnight Flamingo Hill tented Camp. 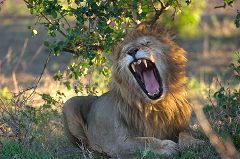 Early moring game-drive - there are chances to meet some of the big five - followed by breakfast at the lodge. After breakfast, drive toward Samburu via Nyahuru (green route on the map), with picnic lunch. 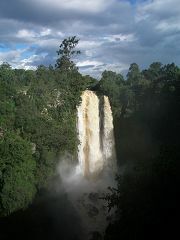 On the way, visit to Thomson Falls. In the afternoon, arrive at Samburu passing through the Archer's Gate. Dinner & Overnight Samburu Game Lodge. Early morning game-drive followed by breakfast at the lodge. After breakfast relax at the lodge. Lunch at the lodge. Afternoon game-drive according to clients wishes and agreement with driver: you can cross the Uaso river and reach the Intake Springs. Along the way, some of the big five are likely to be seen. Dinner & Overnight Samburu Game Lodge. Early morning game-drive followed by breakfast at the lodge. After breakfast departure from Samburu and drive towards the Aberdares (yellow route on the map). Lunch at Outspan Hotel in Nyeri. After lunch transfer to Treetops (this will be done by Treetops vehicles as no other vehicles are allowed into the Salient of the Aberdares). Afternoon game-viewing from the lodge. Dinner & Overnight Treetops. At 7 am you will be driven from the lodge back to Outspan hotel in Nyeri where breakfast will be served. After breakfast drive towards Amboseli National Park (blue route on the map). Picnic lunch on the way. Arrive at Amboseli in the afternoon. Game-drive late afternoon: enjoy the sunset with a lot af animals roaming free. Dinner & Overnight Ol Tukai Lodge. 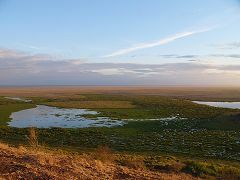 Early morning game-drive - Amboseli is one of the best place in Kenya to watch elephants - followed by breakfast at the lodge. After breakfast relax at the pool and enjoy the view on the plains and Kilimanjaro. Lunch at the lodge. Game-drive in the afternoon, according to clients wishes and agreement with driver, you can reach the Observation Hill from where you can have a extremely wide-look to the plains and the Enkongu Narok Swamp. Elephants and buffalos are likely to be seen. Dinner & Overnight Ol Tukai Lodge. Early morning game-drive followed by breakfast at the lodge. Drive back to Nairobi and transfer to the airport. Some game-drive vehicles are watching a group of zebras. Amboseli National Park is home to numerous animals including large populations of elephant, buffalo, cheetah, lion, leopard, giraffe and gazelle. The Sacred Ibis normally feeds on wetlands but often scavenges for food around human habitation. It's quite easy to distinguish it from the other Kenya's Ibises due to its white wings black-fringed all the way around. Elephants are the longest-lived large mammals. One of the few animals that shows recognition of one another even after death. Females will stand watch over their dead young and may even cover the body with branches and twigs. The twenty-five tents of the camp are all furnished with the understated luxury required by the modern traveler. Decorated with natural natural woods, wrought iron and crisp cottons each tent has been meticulously planned to maximise comfort. 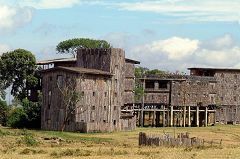 Keekorok Lodge was the first lodge built in the Kenya's Masai Mara National Reserve (1962). 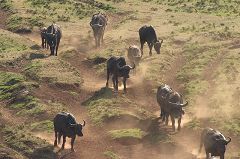 it's in the direct path of the Mara's wildebeest migration. 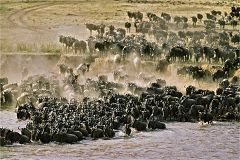 There is always plenty of activity around the waterhole but during the migration, the lodge is surrounded by the swarming mass of animals. 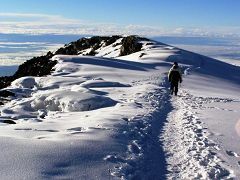 One of the most amazing aspects of the Kilimanjaro (5.890 meters) is the accessibility of its peak to climbers with no mountain climbing equipment. It takes more or less five days to reach the top and return. 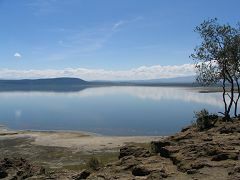 Lake Nakuru national Park is the home to over a million flamingoes. Fleets of Lesser and Greater Flamingoes line the shores of Lake Nakuru giving it a pinkish appearance. Besides flamingoes, Lake Nakuru is home to other water birds including a variety of terrestrial birds numbering about 450 species in total. Both the black and white species of Rhinoceros are in fact gray. The white rhino name is a corruption of the Afrikaans word for wide. The wide refers to the white rhino's broad upper lip that is designed for grazing. An elephant is entering the Swamp. A group of buffalos on the Amboseli wetland. African Buffalo (or Cape Buffalo) is absolutely the most dangerous of the big five. An adult male might weights 600-750 kilos. Despite this vegetarian and somewhat pastoral appearance they are fearsome animals, killing more people than lions or crocodiles ever do. At the lodge you may find 80 chalet-style rooms; some of them viewing the wetlands, others facing the Kilimanjaro. To accomodate physically challenged guests, two rooms have been specifically designed according to EU standards. The Samburu Game Lodge is surrounded by a pristine riverine forest on the western bank of the Uaso River. It's 857 meters above sea level. 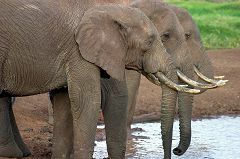 Large herds of elephants are seen along the rivers banks which are much favoured by crocodiles. The guests of the lodge are given the opportunity to take a tour of the Cultural Village. They are introduced to all aspects of Samburu culture. A spoken journey through Samburu traditions including dances for both women and moran, and Naapo evening meeting for men. The different costumes worn by both girls and women are also explained. The three game reserves of Samburu, Buffalo Springs and Shaba all cluster in one largest area of more than 800 square kilometers. Nevertheless, most of the game viewing is concentrated in the narrow strips along the river banks in Samburu and Buffalo Springs reserves. Many reserves have all the big five - lion, leopard, elephant, rhino and buffalo - but it's not that easy to see them all, particularly leopard. Leopards are nocturnal, secretive and well camouflaged, but there are some reserves where they are more easily spotted than others. Samburu is one of these places. Amongst the many traditions kept by Masai tribes the best known is the warrior jumping dance, where young Masai morani (morani stands for young warrior) leap into the air from a standing position, in order to demonstrate their strength and agility. Until recent times, in order to earn the right to have a wife, a Masai moran was required to have killed a lion. Officially this practice is deprecated although there are some evidences that it continues in some remote regions. The kudu horn is a means to communicate amongst the villages. The kudu itself (Koodoo) is a sort of antelope which roams from South Africa to Ethiopia. Its bull may stand over five feet high and may be colored from a reddish gray to light blue. The kudu sense of smell, hearing and its keen sight, make it a difficult animal to capture. Built in 1987, the Sekenani Primary School provides a free education to approximately 450 students from 5 to 14 years old. There are three terms per year, running in January to March, May to July and September to November. Some teachers are provided by the government, some others by the student's parents. Located on the furthermost eastern corner of the Maasai Mara National Reserve, near the Ololamutiek Gate, the Mara Sopa is set in a hillside landscape of the Oloolamuita Valley 230 km South West of Nairobi. Masai Mara Sopa Lodge totally blends in perfectly with its surrounding hillside landscape; the Maasai people, a shrine of wildlife, bird life, and natural flora to be found in the fabled Masai Mara National Reserve. After dinner, tourists are used to gather by the fire. 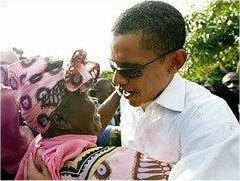 In Maasai language, sopa means welcome. It takes approx 5 hours to reach the Mara region by car from Nairobi (45 minutes by air). The lodge itself is hut-styled, having the interior design of the public areas and rooms inspired by the Maasai culture and art. Uaso stands for brown water (river) in the local Samburu tribe's language. Huge herds of elephants are likely to be seen drinking and cooling off along the banks. The Samburu area is very dry with a lot of scrub and some acacia trees, except along the banks of the quiet Uaso Nyiro river where there's a narrow stripe of doum palms which contain and shelter a lot of wildlife. The Uaso flows through three great northern reserves, Samburu, Buffalo Springs and Shaba. Crocodiles are typical inhabitants of Uaso river. They are able to survive through dry spells by burying themselves in the mud. During the hottest hours of the day they're used to keep their mouths wide open to cool themselves down. 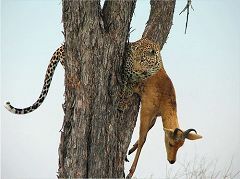 Since their digestive system can handle rotting meat from old carcasses, they are very effective at waste disposal (unlike many other carnivores which require fresh meat).